Water demand and land development could mean the end of an iconic species, even in wealthy and liberal Marin County. In the woods of western Marin County, concealed beneath a canopy of redwoods and oaks, a stream runs like a ribbon through the San Geronimo Valley and empties into Tomales Bay. This waterway once hosted several thousand spawning Coho salmon every winter. For weeks, the two- to three-foot-long fish stormed upstream in schools of hundreds and entered small tributary creeks to spawn and seed the next generation of their species. Today, the Coho of Lagunitas Creek are nearly extinct. Todd Steiner sees just a few dozen fish swim upstream every year — down from about a thousand two decades ago, when he first moved to western Marin County. Steiner is director of the Salmon Protection and Watershed Network, or SPAWN, based in Forest Knolls, a town of 1,800 people. SPAWN monitors Lagunitas Creek’s salmon run by counting adult spawners and keeping tabs on numbers of trout-sized juveniles. The ongoing West Coast drought has dried up some of the small tributary streams where the Coho spawn, or where juvenile fish have historically resided. As a result, the already withered population, strained by the impacts of suburban development, is being pushed to the brink. Even if a rainy El Niño winter brings relief to California’s parched watershed, forecasts for a long-term dry period may bring doom for these salmon. While Steiner’s organization has made gains for fish conservation in places, the fight to save salmon has gotten ugly. SPAWN has alienated itself from landowners and lawmakers in the community by promoting severe building restrictions. The way Steiner sees it, there is no time to play nice. Just several dozen salmon spawned in the winter of 2008, and the population remains in the low hundreds. SPAWN has sued the county twice in its efforts to reverse ecological damage to local streams and prevent any more damage from occurring. The problem affecting the local salmon, Steiner said, is simple. “This isn’t rocket science. As an area gets more developed, the salmon disappear,” Steiner said. The Lagunitas Coho, part of a group of federally endangered coastal salmon, are one among many tales of salmon decline in California. The state once teemed with dozens of unique salmon runs on its creeks and rivers, both along the coast and extending far into the cold mountain canyons of the Sierra Nevada. Those millions of fish — including steelhead trout and Chinook salmon — have been reduced to thousands after a century of dam building, habitat destruction and water diversions. The current drought — recently estimated in one study as the worst in 500 years — now threatens to write the final chapter for many of these salmon runs. 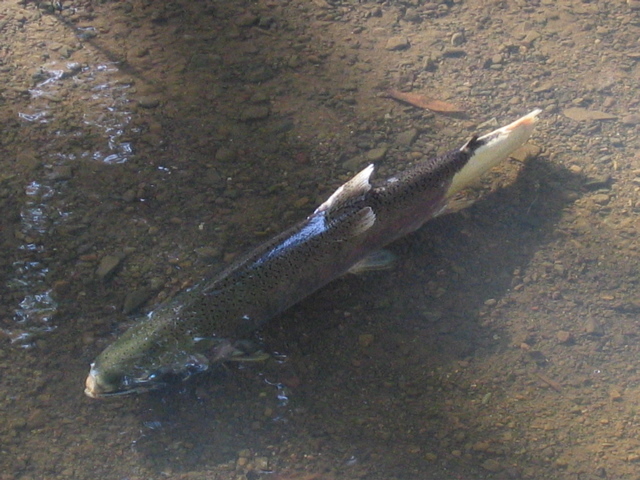 The Lagunitas Creek Coho have become locally famous as one of the last viable populations of the species south of Oregon. Each time the fish begin to show in Lagunitas Creek’s shallow rifles, they make newspaper headlines and draw throngs of viewers to watch the salmon — swimming upstream bright red in their spawning colors — from bridges and high banks. The salmon spawn just an hour’s drive from downtown San Francisco, in western Marin County — a nucleus of nature lovers, where mountain bikers, bird watchers and plastic bag bans are common. The fact that an iconic population of salmon is now dwindling toward extinction within a well-to-do community of environmentalists and liberals could be a foreshadowing of the fate that some scientists believe will eventually befall nearly all California salmon. The lower portions of the Lagunitas watershed are preserved in state and federal parkland. Upstream, however, the land has been developed. Dams have blocked salmon from accessing about half their historical spawning grounds. Those streams where the fish can still spawn now flow through high-priced real estate. Hundreds of homes have been built through the years, many with private water wells, and many with water systems that directly divert from streams. Clearing of streamside shrubs and trees by some property owners has also caused problems — especially by inhibiting the land’s ability to soak up rainfall. This means winter storms that once would have saturated the soil and allowed slow percolation of water into streams over periods of weeks now cause abrupt and brief flooding events, which can turn creeks into lethal torrents of whitewater, killing baby fish. Later in the year, the same streams may dry out. Deforestation has also exposed once shaded water to the sun, making it too warm for fertilized salmon eggs, which need cool water — no warmer than 65 degrees Fahrenheit. Deforestation also means less woody debris in the water, which creates eddies and refuge pools for small fish, and fewer insects — food for salmon — falling into the creeks. 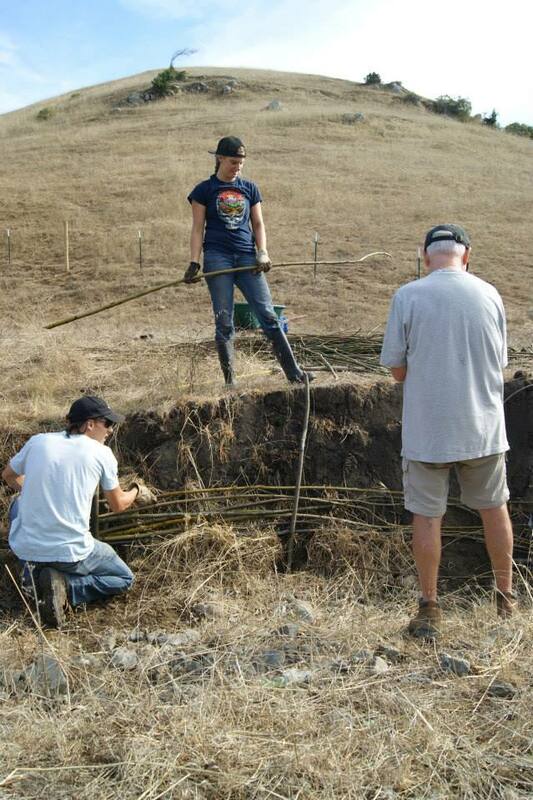 Volunteers work to create a willow wall in 2014 along a portion of Calif., to prevent erosion and support healthy riparian ecosystems. While the impacts of human development on Coho salmon are well understood, correcting the matter has become a life challenge for Steiner. The biggest problem in explaining the potential catastrophe, he says, is that the effects of building homes and roads accrued incrementally. SPAWN has alleged that the Marin County Planning Commission and Board of Supervisors have been too lenient toward development by not assessing the environmental impacts of individual building projects. This, the group argues, has allowed cumulative impacts to mount over time, incrementally crushing the salmon population. A lawsuit filed by the group in 2011 forced the county to rewrite its building ordinance to comply with state environmental laws. The litigation has interrupted development projects in the area, fueling strife among residents and county officials. Marin County Supervisor Steve Kinsey says the local government is fully onboard with restoring the Coho. However, Kinsey feels SPAWN is doing more harm than good to the fish. “Their approach of litigation to meet goals that we all share is incompatible with the county’s approach of working within the existing framework to help these salmon,” Kinsey says. Kinsey, who also happens to be chairman of the California Coastal Commission, has been a salmon restoration advocate for decades. He agrees new development within the watershed must face restrictions. Where things get tricky is in historic neighborhoods, where homes were built decades ago. Here, Kinsey says, SPAWN is treading too heavily upon property rights. Kinsey says there have been instances where homeowners near streams have been barred by SPAWN’s legal action from building small tool sheds, swings for their children and fences around vegetable gardens. Some locals have argued that their homes are located beside ephemeral creeks that vanish in the summer and which are therefore of negligible value to fish. Gail Seymour, a biologist with the California Department of Fish and Wildlife, says this isn’t true. The tiny tributaries of the Lagunitas Creek system — some so small that a person can step across them — provide valuable refuge for juvenile salmon during high rainfall periods and flood events. Development of homes and properties tends to destroy these little streams when property owners divert water and clear vegetation near stream banks. In some cases, leaky residential septic tanks pollute the water with pathogens and nutrients. This is a problem with old as well as new homes, many of which are still built with septic systems. Kinsey says the county has assisted homeowners in modifying properties — especially in eliminating paved surfaces that accelerate destructive runoff. SPAWN has been involved in many such projects, too. Steiner and volunteers have helped local landowners plant native vegetation on their properties. The group has also worked with the San Geronimo Golf Course to restore stream banks so that rising waters may spill into side channels after periods of heavy winter rain, providing shallow and slow-moving refuge zones. Recently, Steiner and assistants placed a fence along a stream to keep local cattle from trampling salmon spawning habitat. Hundreds of thousands of Coho once spawned in nearly every stream that meets the ocean along the California coast. By swimming into the coastal forests, laying and fertilizing eggs and dying, the fish played an important role in forest ecology. Scavenging raccoons, otters and bears carried salmon carcasses deep into the woods, nourishing the forest floor with tons of marine biomass. This was once so prevalent that scientists have identified marine signatures embedded in ancient wood, and research has shown that the health and vigor of trees can decline when salmon are removed from an ecosystem. Wines made in inland California even contain compounds of marine origin — almost certainly remnants of salmon. Steiner believes that, just as the Coho have been incrementally pushed toward the brink by development, the fish can be incrementally coaxed back. Eventually, he envisions Coho salmon becoming a viable part of the California food chain again, abundant enough to be fished by people for food. Seymour, at the Department of Fish and Wildlife, also believes the Coho’s decline can be reversed if local development of homes and wells is halted. But she is less optimistic than Steiner. The population has been struggling even in times of abundant water. Seymour believes the increasing scarcity of water, and predictions that California will enter a long-term dry period, leave the salmon with little chance of recovering.